Where Can I Find User MFA Sample Code? Our User MFA endpoints make it simple to increase your application’s security by strengthening end-user authentication. 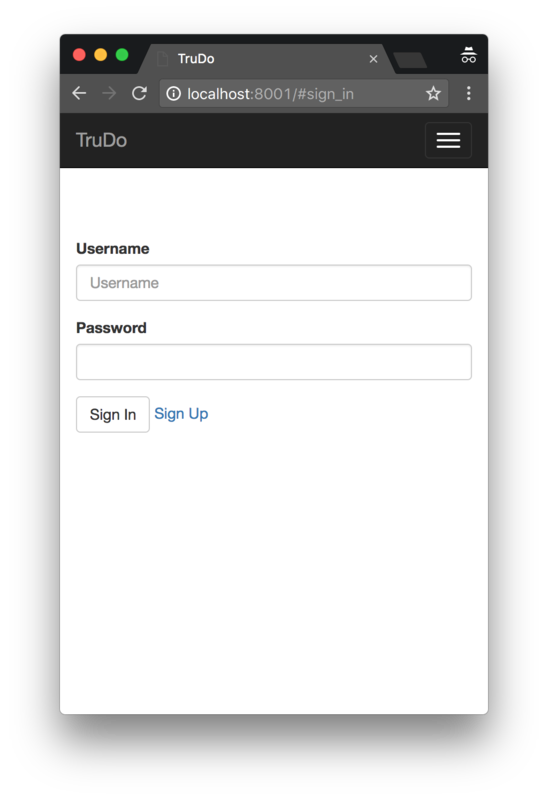 To show how the integration works, we’ve created a simple JS application that uses TrueVault for user authentication and data storage. Then we implemented User MFA in a separate branch so you can see exactly what it takes to add User MFA to your existing application (see the difference here). The details may vary based on your application stack, but the flow (and of course, the TrueVault API Endpoints) will be the same. In this screencast, Manuel walks us through the changes required to implement MFA. We’ll cover the highlights below the video. You’ll probably want to check out the implement-user-mfa branch of the sample app for reference. 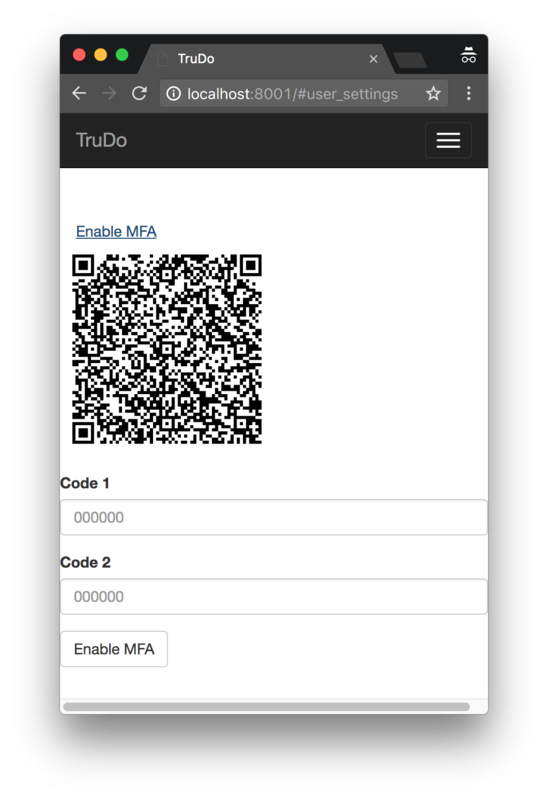 Then, let’s look at the high-level steps required to add User MFA to an application already authenticating with TrueVault. Users need to enroll in MFA to get started. This step is nothing more than a shared-secret exchange, following the TOTP Spec. The user asks TrueVault to start enrollment, get’s back a shared secret, encoded in a QR Code, and scans that with their authenticator app to save the secret. Users can pick their favorite authenticator app, as long as it follows the TOTP Spec. We recommend either Google Authenticator or Authy. Then, our security-conscious user finalizes enrollment by copying two consecutive codes from their authenticator and sending them back to TrueVault to verify. 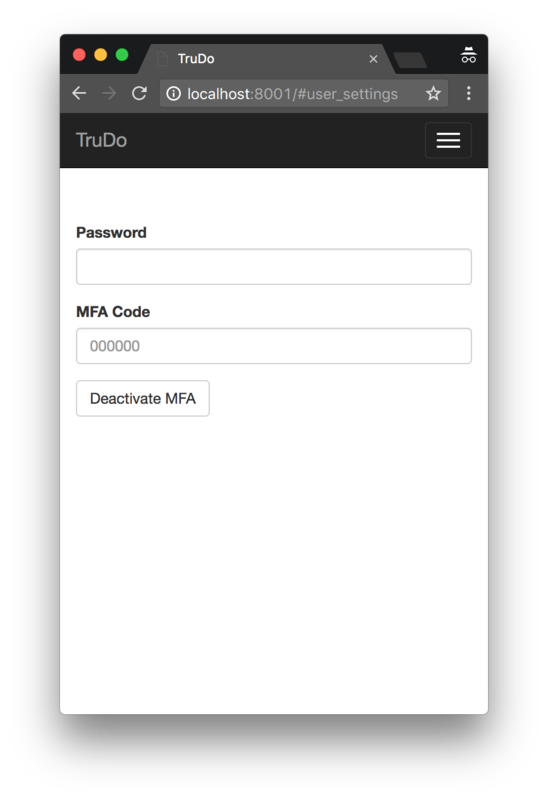 TrueVault validates that the authenticator app was setup properly, and then ensures all future login requests for that user must provide the User MFA. 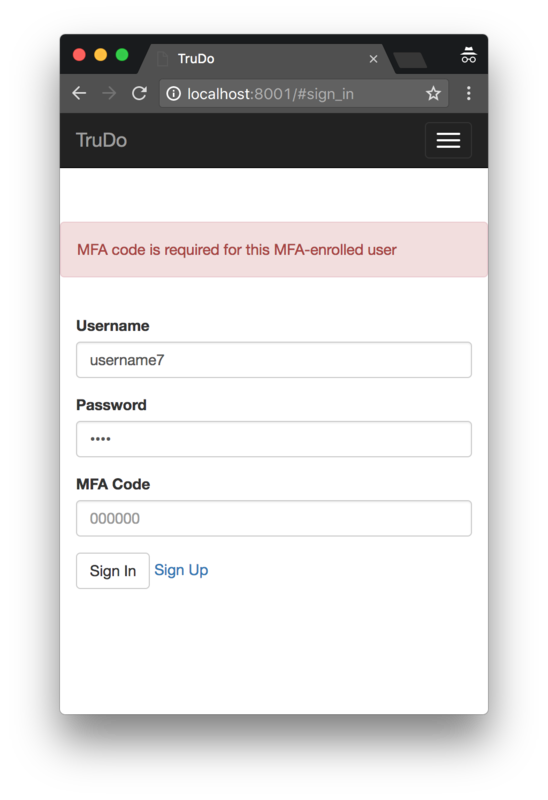 Once the user is enrolled in MFA, they must provide a current code from their authenticator app every time they log in. There is a little subtlety to this implementation for you, since your application may not know if users need to enter an MFA code or not. You have a couple of options. You can always show the MFA field, and let users enter it if they want. This option feels pretty lame from a UX standpoint, so we don’t recommend it. Instead, you can attempt to login without MFA and look for a special error code from TrueVault indicating that MFA is required for this user. Then you can present the MFA field and complete the login. Our sample app follows this flow. The login handler tries to log in without MFA the first time. Then if it sees USER.MFA_CODE_REQUIRED in the response, it knows this user needs to provide MFA to log in. It shows the MFA field and waits for a resubmit. When they enter the code and hit the login endpoint again, they’ll be successfully logged in. Note that the application hits the same login endpoint each time. That endpoint optionally takes the MFA Code, and if you omit it when it should be given, it responds with the USER.MFA_CODE_REQUIRED error type. It’s important to support unrenrolling in your application. Even if all of your users are bought into the value of MFA and enroll religiously, you’ll still need to support un-enrolling when they get a new phone. Then the user can start from the beginning and enroll their application again. We hope this sample application makes it crystal clear how to add MFA to your application. If you have any lingering questions, check out our User MFA Tutorial or ask on Stack Overflow.